The 4,200-guest Norwegian Escape is one of the largest cruise ships at sea and the largest in the Norwegian Cruise Line fleet. The cruise ship features many onboard activities, both indoors and outdoors. This article features photos and information on just a few of the things to do outdoors on the Norwegian Escape. Norwegian Cruise Line chose some of the best features of the Norwegian Breakaway and Norwegian Getaway in its design of the outdoor decks on the Norwegian Escape. 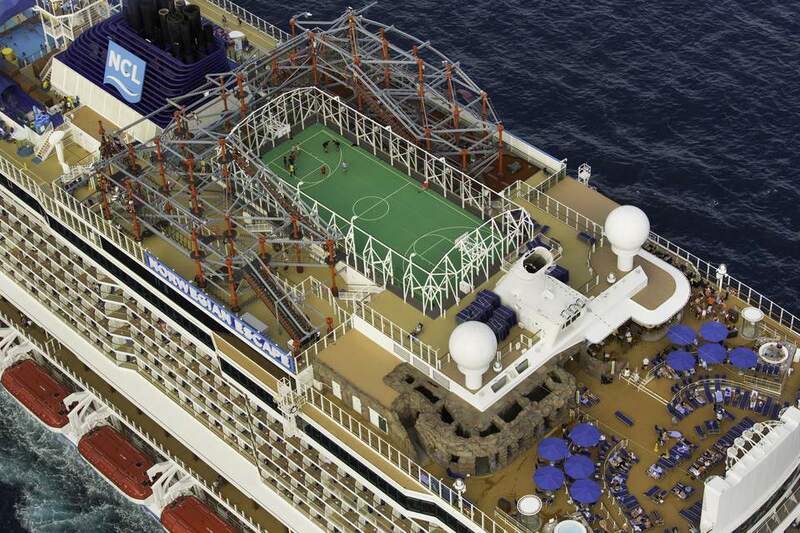 The new ship has a huge outdoor sports complex with a Ropes Course, basketball court, miniature golf course, and even a place to play bocce ball. The Aqua Park on the Norwegian Escape is one of the largest at sea, with four water slides, a Kid's Aqua Park, two swimming pools, and four hot tubs. The next 8 pages provide a closer look at many of the things to do on the outdoor decks of the Norwegian Escape, starting with Spice H2O, which is the adults-only outdoor area on the cruise ship. Located aft on deck 17, Spice H2O is the Norwegian Escape's outdoor adults-only daytime getaway space. It features a couple of hot tubs, a large outdoor movie screen, a bar, and even a waterfall grotto for adults to enjoy and explore. This large grotto in the Norwegian Escape Spice H2O has a waterfall, much-wanted shade from the sun, a place to wade, and even a few cubbyholes to sit with someone special and listen to the gurgling water. This spot is fun in the daytime and at night, when it is open to everyone. The Spice H2O Bar is popular day and night. In the evening, the outdoor space is open to everyone, and the large outdoor video screen is used as an integral part of outdoor dance parties. The views from the aft of the Norwegian Escape cruise ship are exceptional. This Ropes Course on the Norwegian Escape cruise ship is as challenging as it looks. With 99 different elements to conquer, guests traverse three stories of elevated ropes that stretch the entire width of the cruise ship. The course includes two Planks, which are six-inch wide beams that extend eight feet over the water from the side of the ship. Since the Ropes Course is on deck 18, it's a long way to the water below! The course also features three Sky Rails, which are like mini-ziplines. The longest Sky Rail even zips out over the water (and back). Kids won't feel too left out since the Norwegian Escape also has a Ropes Course just for them. This smaller version has two of its own Sky Rails. If the Ropes Course doesn't wear out the kids and adults, then maybe the Aqua Park will. How does this water slide look? Pretty exciting, isn't it? It's part of one of the largest Aqua Parks at sea on the Norwegian Escape cruise ship. This water park features four multi-story waterslides, an area just for kids, two swimming pools, and four hot tubs. The Aqua Racer slide is a tandem water slide that enables competitors to race side-by-side on tubes. Similar to the Norwegian Breakaway, the Aqua Park has two side-by-side Free Falls, where the floor disappears and adventurous guests drop into a thrilling loop. Not all the water slides are as challenging or exhilarating as these. There is also a tamer version, open flume slide. The Kid's Aqua Park has its own enclosed tube slide, a two-story climbing structure, water cannons, and buckets that drench the shrieking kids. Not everyone wants to be active on vacation, so the Norwegian Escape has a swimming pool, hot tubs, and lounge chairs just for those who want to relax. As seen in this photo, the pool deck also has large video screens to keep you entertained (or irritated). The Norwegian Escape swimming pool is good-sized, with a small stage for entertainment. Lounge chairs surround the swimming pool, enabling Norwegian Escape cruise ship guests to relax in the sun or the shade. The Guy Harvey hull art on the bow of the Norwegian Escape is an excellent example of the work of this renowned marine wildlife artist's work. It's especially appropriate for a cruise ship based in Miami.